Effective at temperatures up to 750Â°F and suitable for cryogenic conditions,Â McLube MoS2-900 chemically and thermally stable, water-based molybdenum disulfide forging lubricant and bonded dry film lubricant is also suited for use asÂ general-purpose dry lubricant as well as run-in lubricant. Dry lubricant coating, after evaporation of water,Â exhibitsÂ durability, 0.035 coefficient of friction, and 225,000–500,000 psi load carrying capability. Product prevents seizing, galling, and scoring. The McLube Division of McGee Industries, Inc. has developed a water-based molybdenum disulfide forging lubricant and bonded dry film lubricant. The dry lubricant coating resulting after evaporation of the water has excellent adhesion to most substrates and exhibits a low coefficient of friction, high load-carrying ability, and good durability. The product, McLube MoS2-900, will protect and increase the life of the die. Due to its excellent and superior performance attributes current users have found the product to be an economical alternative to currently used forging lubricants. McLube MoS2-900 is also recommended to be used as a general purpose, dry lubricant for metal forming and a range of other industrial uses, including: all types of sliding surfaces; mechanical parts; threaded connections, conveyors, guide posts, O-rings, seals, sleeve bearings, spline drives, and others. It’s also recommended as a run-in lubricant. Surfaces to be coated should be clean and dry. Any conventional application method can be employed – brushing, dipping, wiping or spraying. It is effective for preventing seizing, galling, and scoring, and for protection against extreme pressure. It performs well as a lubricant under dusty or moist conditions, and protects against corrosion. 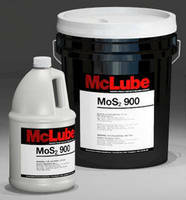 McLube MoS2-900 contains no oil, grease, wax, silicone, or graphite. It has a specific gravity of 1.12; weights 9.4 lb/gal., and the coefficient of friction of dry film is 0.035. Molybdenum disulfide has a load carrying capacity from 225,000 upwards to 500,000 psi, beyond the yield strength of most metals. Applied coating is effective at temperatures up to 750°F and suitable for use under cryogenic conditions. McLube Mos2-900 is chemically and thermally stable. It is environmentally and operator friendly containing no hazardous materials.